Speak Up America 2015 is almost here! Mark your calendars! Speak Up America is just around the corner, taking place from December 7th through 11th! In honor of this year’s superb survey period, we’re holding a celebration just for you – our Speak Up participants and supporters. During this week long event, we’re bringing back our Speak Up 2015 preliminary data snapshots, opportunities to win free conference registrations, and our photo and video challenges with chances to receive classroom or school grants. Now’s the time to kick your survey promotion into high gear – visit our Speak Up America promotional materials page for ideas on how you can spread the word before December 7th. ▪ Classroom/School Grant Photo and Video Challenge – with 5 chances to win! ▪ Free National Conference Registrations – multiple chances to win throughout the week! ▪ Free Regional Conference Registrations to CUE, NCCE, NETA, and TCEA. ▪ Speak Up 2015 Preliminary Data Snapshots – released daily! We hope you all have a wonderful Thanksgiving holiday! Feel free to share your thoughts with us on Facebook, Twitter, and our Blog. The highlight of the Speak Up America 2015 Campaign will take place on Wednesday, December 9, 2015 with National Speak Up Day! National Speak Up Day is the day to encourage your community to participate. We would like everyone to have a voice in the future of how technology is used in our nation’s schools, so please share this link http://www.speakup4schools.org/speakup2015 with your students, teachers, parents, administrators, community organizations, members, affiliates or anyone who has a passion for improving education and ask them to take the Speak Up survey. Educators, win a grant for your classroom or school just by having your students participate in Speak Up! Planning to have your class or school participate in Speak Up this week? Already had your class or school participate? Need a little incentive to get your class or school to participate? Get your photos and videos ready for our Speak Up for America Photo and Video Challenge – we’ve already had a few entries submitted, so start brainstorming! To celebrate technology and all our wonderful Speak Up participants, we will be offering $225 grants to three lucky Speak Up participating classroom or school during the week of December 7th. 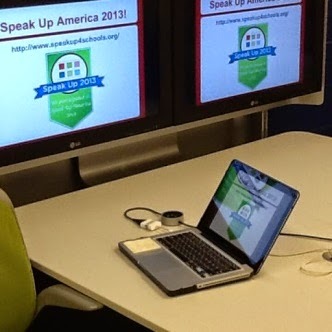 All you need to do is take a picture with the Speak Up for America 2015 Badge (above) highlighting your Speak Up experience and upload to one of our social media sites or the photo challenge page. Contest is open now, so get your cameras out and shoot a photo showing you and your students Speaking Up! For contest rules please visit our photo challenge page here. All you need to do is create a short 15-30 second video answering the question above. Use this opportunity to get your class involved by making this into a class project. Submissions can come in the form of videos, animations (PowToon), slideshows, voice snippets and more! The more creative the better! In this challenge, there will be 2 grant opportunities to win $225! Never has your chance of earning a classroom grant been easier. Enter your#VoicesofSpeakUp video into the Speak Up America video challenge today! Learn more about the video challenge contest rules here. 1. Get in any last minute surveys! Any survey that comes in during Speak Up America 2015 campaign beginning Monday December 7, 2015 through Friday December 11, 2015 (in addition to surveys already submitted earlier in the survey period) will be entered into the competition. Increase your chances to win! 2. Encourage participation in National Speak Up Day (12-9-15)! Every survey submitted on this date will be entered into a separate drawing for a free ISTE 2016 Conference & Expo registration. Free Regional Conference Registrations to CUE, NCCE, NETA and TCEA. Are you a California, Nebraska, Nevada, Texas or Northwest (Idaho, Montana, Oregon, or Washington) district? You’re in luck – the awesome folks at CUE, NCCE, NETA, and TCEA are also offering free conference registrations! Winning is as easy as speaking up! All you need to do is encourage your staff, students, their parents and the local community to participate in Speak Up. Every participant from your district will enter you in to the drawing to win – the more surveys you have in the more chances you have to win!One winner will be selected for the NETA, NCCE, and TCEA conferences, and three for the CUE conference. We will randomly select a survey from your state and announce the winners on Friday, December 11th at 5PM PT/7PM CT/8PM ET. We will also be releasing preliminary data reports to all participating schools and districts during Speak Up America week! Stay tuned for more details. Many thanks to our sponsors and partners for the support of Speak Up: Blackboard, Inc., BrainPOP, CDW, DreamBox Learning, Fuel Education, Qualcomm Wireless Reach, Rosetta Stone, Scholastic Education, American Association of School Administrators, Consortium for School Networking, CUE, Digital Learning Day, iNACOL, International Society for Technology in Education, National School Boards Association, National School Public Relations Association, National Science Teachers Association, National Secondary School Principals Association, State Education Technology Directors’ Association and TCEA (Texas Computer Education Association). This entry was posted in Speak Up and tagged National Speak Up Day, photo challenge, Speak Up America, Speak Up America 2015, video challenge on November 20, 2015 by Lisa Chu. Exciting new Speak Up opportunities! Speak Up America may be over, but we still have several exciting events and opportunities during the last week of Speak Up! Check them out below, and don’t forget to take the survey before it closes this Friday, December 19th. Participate in Speak Up this week for a chance to win a free 2015 iNACOL Blended and Online Learning Symposium registration! Our friends at the International Association for K-12 Online Learning (iNACOL) have graciously donated a free 2015 iNACOL Blended and Online Learning Symposium registration to one lucky Speak Up district. If you have ever wanted to attend the symposium, this is your chance! Winning the free registration is easy – all you need to do is encourage your staff, students, their parents and local community to take the Speak Up survey before the survey period ends on December 19th, 2014. Each survey from your district will serve as an entry into a special drawing for a chance to win the free symposium registration – the more surveys taken, the more opportunities your district has to win! Save the date for the 2015 iNACOL Blended and Online Learning Symposium in Florida from November 8-11, 2015! To learn more about the symposium and iNACOL, visit their website at http://www.inacol.org/. Save the Date now for #BbWorld15 in Washington DC because here’s your chance to win one full conference badge! Speak Up America week may be over but the fun is just about to begin! In a special extension of our Speak Up America promotions, our good friends and wonderful sponsors of Speak Up, Blackboard has offered a free BbWorld 2015 conference badge to gift to one lucky Blackboard district during our final week of Speak Up! Winning is as easy as speaking up! All you need to do is encourage your staff, students, their parents and the local community to participate in Speak Up during the final week of Speak Up. This is a great way to reach out to different audiences that may have a lower participation numbers than you would like, for example to target your K-12 parents, teachers or local community members! The more surveys you get in, the more opportunities you have to win! In addition to your free BbWorld conference badge, the selected recipient attending the conference will also have the opportunity to join our CEO Julie Evans for dinner in Washington DC. Here’s your chance to pick our CEO Julie Evans’ brain on all things digital learning! *Transportation and housing costs are not included. Idaho, Montana, Nebraska, Oregon, and Washington districts turn up the volume and Speak Up! As part of our Speak Up America campaign, our good friends at NCCE and NETA offered us free conference registrations to their upcoming 2015 conferences. With Speak Up America week coming to a close, we’ve received quite a few requests for an extension on these popular regional conference registration opportunities. To ensure everyone has a chance to Speak Up we will be extending this great promotion to all districts in these states so that everyone has the same amazing opportunity to win. So Idaho, Montana, Nebraska, Oregon, and Washington get out there and SPEAK UP! Be sure to assign a primary contact to your school or district, otherwise we will have no way of contact you and more importantly we’ll have no way to send you your 2014 Speak Up data results come Feb. 2015! Nebraska Districts: Mark your calendars for April 23rd-24th and be “On the Move” for the 2015 NETA Spring Conference with an opportunity to win a free conference registration for one lucky member of your team ($125 value). Our friends at NETA have offered a free conference registration to one lucky district in the state, all you need to do is encourage your schools to participate in Speak Up during the final week of Speak Up! The more surveys you get in, the more chances to you have to win! Learn more about the NETA conference and all of its great offerings here. Photo and Video Challenge Extended through Wednesday, December 17th! Thank you to all who have submitted their #SpeakUpsnapshot photos this week! On Monday we will be choosing one winner from Speak Up America week’s photo challenge entries to receive a $250 classroom/school grant. Due to multiple requests, we have decided to extend the photo and video challenge through Wednesday, December 17th. We understand that many of you plan on participating in Speak Up next week and we wanted to give everyone an equal opportunity to win. Therefore, all photo and video entries submitted next week through Wednesday, December 17th by 12PM ET will be entered into a separate contest with a total of four opportunities to win $225 in classroom or school grants! With more opportunities to win, receiving $225 in classroom or school grants has never been easier – so get your cameras ready and submit your photos and videos today! Winning a $225 grant has never been easier! All you need to do is take a picture with the Speak Up America 2014 Badge highlighting your Speak Up experience and upload the photo to one of our social media sites (Facebook, Twitter, Instagram) or the photo challenge page. All pictures submitted through Wednesday, December 17th will be entered into a contest with up to four opportunities to win $225, so get your cameras out and shoot a photo showing you and your students Speaking Up! All videos submitted next week will be entered into our special Speak Up challenge contest extension, with opportunities to win a $225 grant! With only three videos submitted so far, your chances of winning have never been higher! *All submissions already entered into the contest will be included in the extended contest. This entry was posted in Speak Up and tagged BbWorld, Blackboard, iNACOL, NCCE, NETA, photo challenge, Speak Up, Speak Up America, video challenge on December 17, 2014 by Lisa Chu. One week to go – Speak Up Closes Dec. 19th! Thanks for Speaking Up America! Thank you to everyone that participated in Speak Up America 2014! Over 85,000 students, parents, educators and members of the community spoke up about digital learning this week, and the Speak Up community took on social media by storm with multiple Photo & Video challenge submissions and a Twitter chat with our fabulous CEO, Julie Evans on new and surprising preliminary data findings from this year’s surveys. This year’s survey period has been amazing with over 421,000 surveys already submitted! We still have a week to go, so be sure to participate before the surveys close on Friday, December 19th. ▪ Free BbWorld Conference Registration: Learn how you can win a free BbWorld Conference Badge just by participating in Speak Up. ▪ Free Regional Conference Registrations to NCCE and NETA extended into next week! ▪ EXTENDED: Photo and Video Challenge: You now have four chances to win a $250 classroom or school grant. ▪ Last call, get your Speak Up surveys in by Friday December 19th: Need some ideas to help get more of your stakeholders involved. Check out our list of last minute promotional ideas. ▪ Start making plans now for ways to use the Speak Up data. Local data results for all participating schools and districts will be released on February 5, 2015. If you haven’t already please be sure to take the survey before December 19th! Already taken the survey? Start spreading the word about the survey to your network of friends and family! Word of mouth is always the best promotion, help us expand our reach! Click here to take the survey and pass it on. As part of our Speak Up America campaign, our good friends at NCCE and NETA offered us free conference registrations to their upcoming 2015 conferences. With Speak Up America week coming to a close, we’ve received quite a few requests for an extension on these popular regional conference registration opportunities. To ensure everyone has a chance to Speak Up we will be extending this great promotion to all district’s in these states so that everyone has the same amazing opportunity to win. Idaho, Montana, Oregon, Washington Districts: Our friends at the Northwest Council for Computer Education have graciously offered a free NCCE conference registration ($375 value) for their upcoming March 2015 conference in Portland, Oregon. Like our other free registration opportunities, all you need to do to enter is encourage your staff, students, parents, and the local community to participate in Speak Up. Each survey from your district acts as an entry into the contest – the more surveys taken in your district, the more chances you will have to win! Learn more about the conference and all its great offerings here. Also be sure to check out NCCE’s Tech-Savvy Teacher Blog at: http://blog.ncce.org/. Thank you to all who have submitted their#SpeakUpsnapshot photos this week! On Monday we will be choosing one winner from this week’s photo challenge entries to receive a $250 classroom/school grant. *All submissions already entered into the contest will also be included in next week’s contest. Click here to view all the snapshots. ▪ Host a Speak Up Day: Pick a day in December to have your K-12 community complete the Speak Up Surveys! ▪ Focus on one survey type: Each survey receives their own data set with national comparisons (k-2, 3-5, 6-8,9-12, parent, teacher etc.) a focus on teachers, parents and/or administrators is an easy push and a great way to receive a meaningful dataset. Some recommendations would be to send an email or phone recording to parents or email blast to your teachers. Click here for a variety of sample emails. ▪ Highlight the Speak Up survey on your website using one of our Speak Up logos (with a link to the survey). Click here for the code to embed on your website. Make sure to include your survey password! Participate in Speak Up and share your ideas about how to leverage technology in schools to promote better learning: bit.ly/SU14survey >>> Tweet This! Join the #edtech conversation and share your viewpoints on 21st century education with @SpeakUpEd: http://bit.ly/SU14survey >>> Tweet This! 23 questions + 15 minutes of your time = valuable research for the education community! Take the survey today @ http://bit.ly/SU14survey >>> Tweet This! Are you “Speaking Up” about digital learning this year? Make your voice heard participate in Speak Up 2014 at http://bit.ly/SU14survey >>> Tweet This! Participate in Speak Up and share your thoughts and views on the importance of education within your community http://bit.ly/SU14survey >>> Tweet This! There’s still time to experience the value of #SpeakUp by collecting &using the data to garner support for your key technology initiatives! >>> Tweet This! Reminder to fill out your @SpeakUpEd Survey 2014 by Dec. 19! Don’t miss your opportunity to Speak Up! http://bit.ly/SU14survey >>> Tweet This! Many thanks to our sponsors and partners for the support of Speak Up 2014: Blackboard Inc., BrainPOP, K12, DreamBox Learning, Schoolwires, SMART Technologies, Rosetta Stone, American Association of School Administrators, Consortium for School Networking, Digital Learning Day, Digital Promise, edWeb, International Association for K-12 Online Learning, International Society for Technology in Education, National Association of Secondary School Principals, National School Boards Association, Secondary Education Teachers’ Association, and the Southern Regional Education Board. This entry was posted in Speak Up and tagged Blackboard Inc., photo challenge, Speak Up, speak up 2014, Speak Up America, Speak Up Snapshot, video challenge on December 15, 2014 by Lisa Chu. Educators, win a $250 or $500 grant for your classroom or school just by having your students participate in Speak Up! Planning to have your class or school participate in Speak Up this week? Already had your class or school participate? Need a little incentive to get your class or school to participate? Join in on the fun and take part in our Speak Up for America Photo and Video Challenge. To celebrate digital learning and all our wonderful Speak Up participants, we will be offering a $250 grant to one lucky Speak Up participating classroom or school during the week of December 8th. All you need to do is take a picture with the Speak Up for America 2014 Badge highlighting your Speak Up experience and upload to one of our social media sites or the photo challenge page. The contest is open now, so get your cameras out and shoot a photo showing you and your students Speaking Up! In this challenge, there will be THREE grant opportunities with a 1st, 2nd, and 3rd place prize. 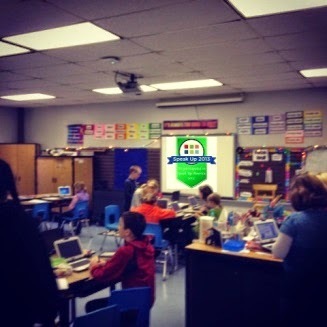 Never has your chance of earning a $500 grant for your classroom been easier. Enter your #VoicesofSpeakUp video into the Speak Up America video challenge today! We are very sensitive to student and participants’ privacy and with that no faces are required to be in the photos and videos. We just ask that you incorporate the Speak Up America badge and student voice (thoughts, ideas, and opinions) into the challenge – the more creative the better! This entry was posted in Speak Up and tagged photo challenge, Speak Up America, Speak Up America 2014, video challenge on December 4, 2014 by Lisa Chu.